Little by little I'm going to see which MBTI types he is mapping here, but what I'm pretty sure about is the J/P scale of the MBTI code, which indicates wheter you prefer to Extravert your Perception or your Judgment. Contrary to popular belief, it's not a mental function unto itself. It merely aids in determining the order and direction of the core preferred mental functions of Sensing, Intuition, Thinking or Feeling (in the I or E directions). All of this is important to the Omnicasting Hypercube concept as well - how I prefer to communicate (form, immediacy and planned/unplanned) is integral to figuring out where on the casting or catching side of the cube *you* are, and as well as those people to whom you are sending or receiving communications. As an Extravert, I prefer to communicate immediately, synchronized and with immediate good/bad feedback to my ideas (which are generally formed via Extraverted iNtuition/Ne). Since my secondary function is Fi - Introverted Feeling, I'm only going to want to express those ideas to intimates, or those I know won't be so dismissive of them. I exhaust Introverts because of this - ideas come out of me fast and furious and I don't reflect on them (it ruins the essence of them, and I probably am not all that married to the original concept anyway). Introverts need the time to reflect on them, and can usually only deal with fewer ideas at a time because of that. 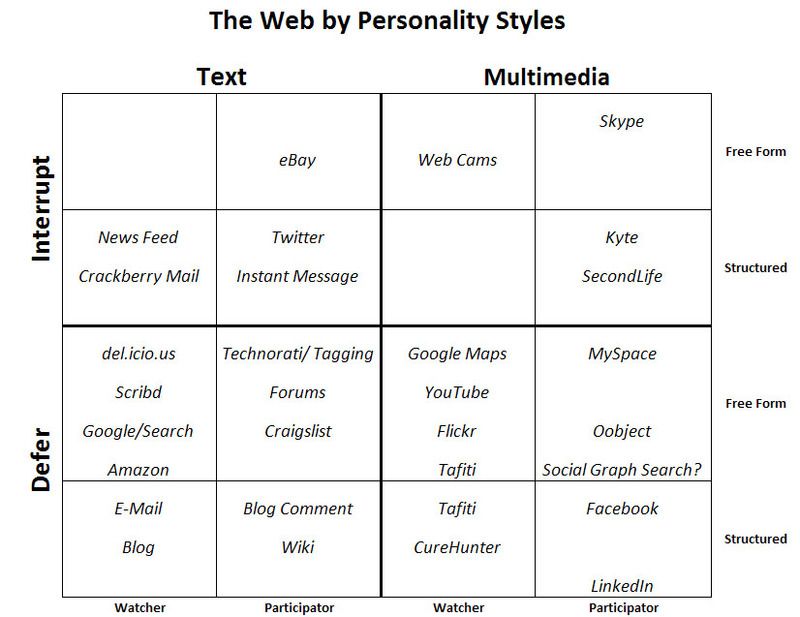 So one can see where Twitter would drive some crazy (it's pure and extreme Extraversion), and Email is seen as a task to others (it can build up to the point where it looks more like a task list than communiques).